The Z-75 is Star's modern, 3rd generation, SMG. 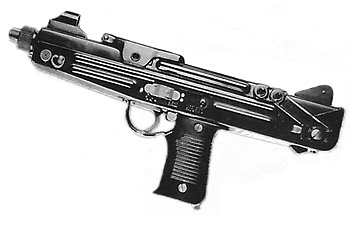 It superficially resembles the UZI, and incorporates the modern features first seen on the Czech M23/25 SMG, such as an overhanging bolt, to reduce overall length. The receiver is of stamped steel, with a square-section bolt riding on rails internally. It contiues to fire from an open bolt in the same method as the earlier weapons, and has the same 20 cm (7.85") barrel length. It weighs 2.6 kg (5.75 lbs) unloaded. The Z-75 was a development and commercial gun, but led to the almost identical Z-84. I have no images and no further information on the Z-75. The Z-84 again replaced the previous Star SMGs in service, starting in the mid 1980s. The theory was to acquire a gun in 9 mm Parabellum, to match their pistols (and the NATO countries finally). It was offered on the commercial market in 9 mm Largo, but none seem to have been made. 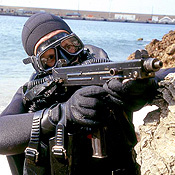 An interesting weapon in the hands of these naval commandos [the UEBC and UOE] is the locally made Star Z-84... It has proved very efficient and reliable even after being submerged and beat up for longer periods of time. The ever-present MP5 is also found. 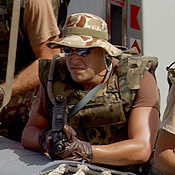 He also says that the CETME Ameli is issued one per Marine fireteam, and a photo shows a commando on a boarding party armed with a CETME model LC. So, Spanish arms are standing fast in the face of foreign weapons like the heavily-issued G-36E. Back to the Z-84 specifications. The 20 or 30-round magazines are inserted through the completely vertical grip (like the UZI) and the magazine latch is a lever behind the magazine, at the bottom of the grip, pressed forward to release. The cocking handle is on the right side of the receiver and the ejection port is on top, with fired cases sent somewhat to the right. 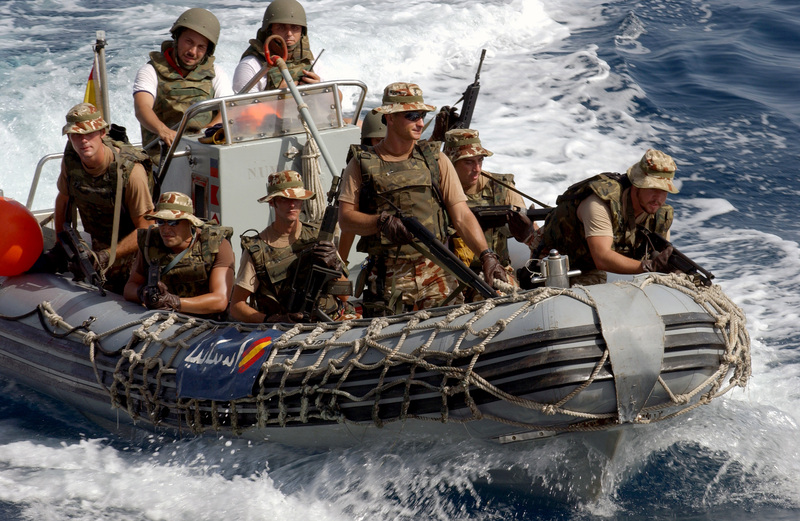 Z-84 in use with Spanish boarding party, Gulf of Oman, 2004. Click image to view larger. 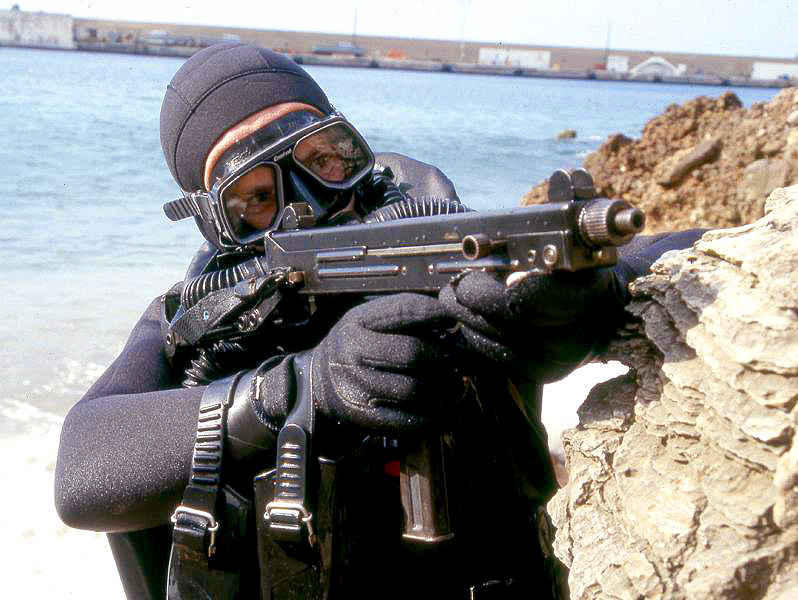 Posed shot of UEBC commando frogman with his Z-84, unusually, with the stock deployed. Click image to view larger. 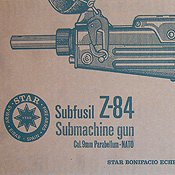 Cover of the cardboard Z-84 box, with printed graphics. Click image to view larger. 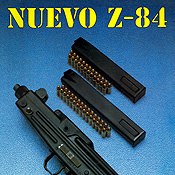 An ad from the mid 1980s advertising the new Z-84 SMG. The safety lever is a cross-bolt type. behind the trigger, inside the trigger guard. The fire selector is a separate switch above the trigger on the side of the receiver. Sliding forward exposes one white dot and sets the gun to semi-automatic fire, sliding to the rear exposes two white dots and sets the gun to fully-automatic, at 550 spm. The Z84 was apparently only made with a stamped steel buttstock which may be folded over the top for storage and locks in both positions. Besides being issued to the Spanish armed forces, some police units and the Guardia, it has reportedly been sold to Angola and Peru, though I do not know which organizations in those countries. The issue weapons reportedly all had 20 cm (7.85") barrels, as shown in the catalog image above. But every variant I have seen in someone's hands in the real world has a shorter barrel, cut off just past the end of the barrel retaining nut. The Spanish military issue model to the left, for example, has the shorter barrel. Without additional information, it may be difficult to determine this feature precisely. There appears to be no model number variant based on the barrel length, so it may simply be an anomaly of pre-production variation. There is a small amount of information about the "G.C." variant of the Z-84. Much of what I am about to say is conjecture, based on my experience, so take it for what it is worth. For starters, I guess that this is for the Guardia Civil, who did accept a number into service. They often have had their own requirements, which have driven the design of Star handguns in the past. Based on the mediocre photos I have, the Z-84 GC appears to be idential to the issued (short barreled) guns, with different sights. The sights themselves cannot be seen, just very different housings and protective shrouds, but these imply totally different sights. They are slightly reminiscent of those found on the CETME L series, so may have tried to replicate the sights on some rifle or other arm issued to Guardia troops, with the aim to simplify training. Or, not. Other apparent differences are probably just that: apparent differences from angles and glare. It is notable that the manual indicates it is in 9 mm Parabellum (NATO). I would not be surprised to find other differences sprung from a desire to try the gun in a different caliber, or preserve the use of 9 mm Largo. I have no idea how many of these were made. Since I have never seen one in any service photos, or found it listed anywhere, it is possible only a few dozen were made up as trials guns. The presence of the manual may be to meet the requirements for the bid, and prove their commitment to the project.